Tennis video games have rarely received much attention in the competitive sports genre. With the usual suspects (football, basketball, baseball, soccer) hogging all the limelight, there's very little elbow room for tennis, no matter how good the game might be. But 2K Sports' latest entry -- Top Spin 4 -- has found the perfect middle ground for novices not to feel overwhelmed by the controls while also providing enough depth to satisfy veterans of the series. Developer 2K Czech has mapped the four basic shots of tennis (flat, slice, lob and top spin) to the four face buttons. It's a solid system that will provide newcomers an opportunity to get their feet wet and learn the nuances of the sport. But if you're looking for that extra layer of depth, the developers added their press-and-hold system. By holding any of the four face buttons, depending on shot you're trying to execute, a meter will show on the screen. Releasing the face button too early or too late will negatively affect the potency of the shot. But releasing at the perfect time will maximize the power of your shot, putting your opponent in uncomfortable situations. But this shot system would fall flat without 2K's impressive physics engine. Weight and momentum play a huge role in each match as shots are executed in an attempt to keep your opponent off balance. This chess match between the two opponents has been authentically captured by 2K Czech, providing startling detail. As in most other 2K Sports titles, Top Spin 4 doesn't skimp on the little things. The game boasts the largest roster of current and former pros in a tennis game to date (25 players), and 2K Czech has done its homework on each player. Current stars such as Rafael Nadal and Roger Federer play strikingly similar to their real-life counterparts, offering a real treat for die-hard tennis fans. You'll even see players execute the impressive (and quite dangerous) between-the-legs shot when tracking down a lob. There's also a vast amount of venues that keep each match fresh. Playing in three of the four grand slam courts (2K Czech couldn't secure Wimbledon) is an obvious highlight, but it's the lesser-known venues from around the world that offer different backdrops to potential rematches. But the courts aren't merely window dressing. Players will accurately glide across clay courts, which begin to show the wear and tear from the action. It's a subtle touch that goes a long way in maintaing the realism. The crowd reaction is also spot on. Though fans will remain quiet during rallies, long give-and-takes will inspire oohs and aahs and after such points, you can hear some fans in the crowd calling out the name of one of the players in the match. It's a realistic touch that true tennis fans will pick up immediately. As great as the ambiance is in each match, the omission of commentators was a letdown. I understand there's no talking during each point in tennis, but in between the points, games and sets, a commentator providing background of the players or even in-game strategy would have been a welcome addition. It's even more peculiar that this was omitted since 2K Sports has really led the way in this area in other sports franchises. Another low point in the audio department is when you're playing with a created player or facing an unknown player, the umpire will say "Player 1" or "Player 2" leads the match ... . To avoid this in its other sports titles, 2K adds nicknames, which would have served this game well too. 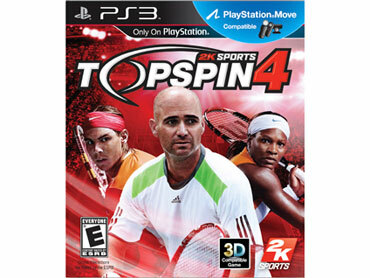 Top Spin 4's career mode allows you to create a player (male or female) and work your way up the ranks. The character creator tools will be familiar to anyone who's played a 2K Sports title the past few years. Tweaking your character isn't limited to your facial appearance or height and weight. Apparel will also give your player a personal flair, and you can choose from most of the major brands like Nike, Adidas and FILA. You can unlock more clothes and accessories as you progress. Before you take the court you have to choose what style of player you favor. There are three options to choose from -- serve and volley, baseline offense and baseline defense. Once you start your career, you will gain experience points but instead of putting these points into individual ratings, you have to choose which play style you want to improve and they will be doled out automatically. You can try to improve each play style but it's best to focus on the one you initially selected. But don't worry about being pigeonholed into a specific style because 2K Czech added coaches, whom you can hire and will provide XP in the areas of their expertise as long as you reach the goals they require. As you continue to level up, the coaches will improve and afford your player more XP but will demand tougher objectives. Playing in the more prestigious tournaments also is a perk you have to earn. Your player's status will increase by completing goals (winning a certain amount of tournaments, gaining a specific number of fans or moving up the tour rankings), which will allow you to play in master tournaments and eventually the grand slams. Though it can sound like a grind, watching your player slowly transform while eventually playing today's stars is enough incentive to keep you progressing. The one drawback to Top Spin's career mode is that you can't take one of the game's established stars and progress that player through the ranks. For fans of specific players, this might be a turnoff. What has been a turnoff in other 2K Sports games has been the online experience, but Top Spin 4 has managed to sidestep this pitfall. The matches are smooth for the most part and the world tour mode is compelling. You can take your created player online and face off against other created players in tournaments, vying for the climb the overall rankings to reach the top spot. Lose and you're out of the tourney, but you can play exhibition matches to continue the online action. Experience points are distributed after each match to further level up your character. Top Spin 4 is one of the rare games that offers a little for everyone who has ever been at least interested in playing a virtual game of tennis. The controls are both simple and deep, the visuals are stellar and the gameplay itself is spot on. A few minor drawbacks keep the game from reaching its full potential but don't let that dissuade you from this impressive title.